SIMPSON BAY, St. Maarten (Sunday, July 20, 2014) - The Princess Juliana International Airport, SXM, Rescue & Firefighting Department (RFF) will be kicking off its Fireman’s Week with a series of activities starting Monday, July 21, 2014 through Sunday, July 27, 2014. The Department will also be celebrating its 19th year during said week, on July 25, 2014. Starting with the hoisting of the flag in front of the terminal building followed by a march with drum band Monday morning, the Fireman’s Week will also feature a free glucose and blood pressure testing for all airport users. This will be held on Monday, July 21 and Thursday, July 24 and will run from 8:30 a.m. – 4:30 p.m. The booth will be manned by SXM RFF personnel who are also certified EMT’s and they will be administering the testing with equipment from SXM’s RFF department. Children from Busybody Play School will first be treated to a tour of the terminal building, after which RFF personnel will take the children on a tour of the RFF facility. Following the tour, the firefighters will offer the children a special BBQ at the fire station. Physical fitness is a requirement for firefighters and to “test” their level of fitness, there will be a Fireman’s Obstacle Course. The firefighters will be competing among themselves to see who can complete the obstacle course in the best time. Following the friendly competition there will be a breakfast for staff and the airport community. The week will close off with perhaps the most anticipated activity: the Fireman’s Certification and Ranking Ceremony at which SXM firefighters will receive their insignia, as SXM officially transitions from the Dutch to the American ranking system. All firefighters who recently completed a 14-week training course, including four weeks of practical training and examinations in Canada, will receive their official Pro-Board seal certificates. It will be recalled that a group of six SXM firefighters returned a few weeks ago from Canada, after successfully completing the National Fire Protection Association 1001 Fire Fighter levels 1 & 2 course. It is the third group to undergo such training, bringing the total so far to 18. 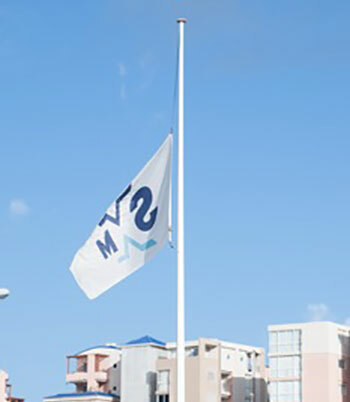 According to Mr. Penijn, Manager of SXM’s RFF, more training courses are planned for the staff in order to further equip them to discharge their responsibilities professionally. “We have been sending groups of six and this is our third group,” he said, adding that new recruits as well as senior officers are given the opportunity to undergo training. 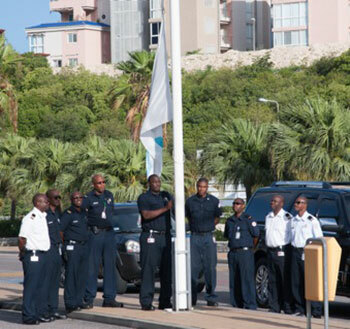 “This allows SXM to have certified and well-trained firemen. It is also important for growth possibilities within the department for the individual firemen,” Penijn said.